Posted on Fri, Mar 23, 2012 : 5:16 a.m. 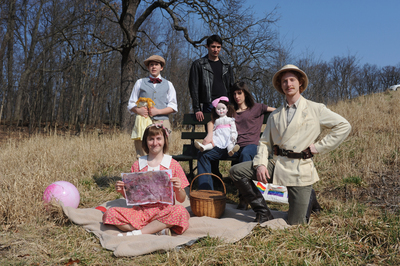 The cast of "Cloud Nine": Standing from left, Emma Birdie Donson as Edward (holding yellow doll), Dan Rubens as Gerry; seated on bench, Emily Berman as Lin; kneeling on right, Kris Reilly as Harry Bagley; seated on blanket holding artwork, Neal Kelly as Cathy. Director Tim Ocel—a St. Louis-based professor and theater artist now in Ann Arbor to direct Caryl Churchill’s “Cloud Nine” for U-M’s department of theatre and drama—gravitated to the play primarily because it was a language play as well as a challenging, or “messy,” play. Why? For one thing, in the first act, set in colonial, 1880s Africa, men play women’s roles and vice versa; a white actor plays a black character, and in the first act, a doll plays the role of a 2-year-old girl. In the second act, set in London in 1980, the characters have aged only 25 years, and the actors exchange roles—including the doll’s character, which is played by a grown man who played the first act’s powerful patriarch. “In the script, the playwright lays out the reasons why she did this,” Ocel explained. “A young child’s energy is very forceful and very masculine, in a way. It’s a force of nature. Who: University of Michigan department of theatre and drama. What: Caryl Churchill’s comedy begins in 1880 colonial Africa, where a British expatriate family struggles to maintain the sexual mores of the Victorian era. Act 2 jumps to London in 1980, where the sexual revolution is in full swing, and the gender- and race-bending characters have only aged by 25 years. For mature audiences. Where: U-M’s Arthur Miller Theatre, in the Walgreen Drama Center, at 1226 Murfin. When: Thursday at 7:30 p.m., Friday and Saturday at 8 p.m., and Sunday at 2 p.m., March 29-April 8. The first act focuses on a British expatriate family living in Africa in 1880 and struggling to live within the strict sexual mores of the Victorian era. The second act, meanwhile, takes place during the sexual revolution in 1980 London, when the characters are free to be who they are, and do what they like, sexually speaking; but having endless choices turns out to be nearly as difficult as being locked into a rigid set of role and rules. “Oppression makes us terribly unhappy,” said Ocel. “But the rules and regulations of the Victorian era were meant to push us forward as a civilization, and it did that. The arts flourished, governments were formed, democracy flourished—out of the chaos, nations were built. So there was something about—human beings need to think about what they are. is not a good thing, either. and not have to change that for someone else’s definition of you? How do you do that and still be connected to and collaborate with a society, and with other human beings? Ocel finds “Cloud 9”’s questions particularly timely as debates about gay marriage, unconventional families, and race continue to heat up. But to think about the compromise necessary for progress on a large scale, we need, as a starting point, to think about how a marriage works, according to Ocel. to allow my partner to be what he or she is?” said Ocel. “And does my husband or my wife also give up something that allows me to be what I am?